After applying for jobs, one would think the hard part is over. Waiting for the company or recruitment agency to get back to you can be unnerving. When the recruiter contacts you for an interview, you’re filled with feelings of joy and hope. You can’t wait to get done with the interview and start out on the new job. But then, it hits you, the interview could prove to be a bigger obstacle. There are probably more candidates waiting to impress and get the position. So, how then do you give your best in an interview? 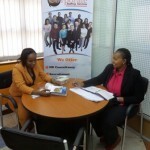 I spoke to Ms. Lucy, an interview coach specialist here at Corporate Staffing Services. Here’s what she had to share regarding how to ace an interview and get the job. While many job seekers know this question will be included in the interview, few actually take the time to prepare. Instead, once asked, they recite the career objective written on the CV and a few pointers on the CV. The recruiter already knows this information. They were impressed with what you said on your CV –which is why you’ve been invited for the interview. However, they do not want to hear you repeat what’s on the CV. What specifically about the role and company excites you? How does your prior experience directly relate to this role? Why is now the ideal time to pursue this opportunity? What specific areas of the role would you excel at? In the age of the digital revolution, information is easy to come by. While this may be perceived as good news, it can only have negative implications. Researching the company doesn’t mean just checking their social media handles. If you do so, you’ll have a narrow understanding of the company. Their customers –Understand who the company’s customers are, what different segments they fall into, and how each product appeals to the customers. Additionally, look for ways the company could better their service to existing customers. Their competitors – Who are the company’s competitors? How does the company differ from its competitors? What can the company do to gain an upper hand against its competition? Their product – Immerse yourself in the company’s products. If you can, engage with the product and get an actual feel. Previously, we have advised you to sound as authentic as possible. While this statement still holds, there are several questions you should go over before attending the interview. Practice makes perfect, and once you know how to rightly answer these questions, you’ll appear more confident and prepared during the interview. While practicing, focus on behavioral questions. Behavioral questions revolve around themes such as leadership, accomplishments, teamwork, problem-solving, and conflict resolution. Every interview is different and needs a unique sense of preparation. While these tips will help you ace your next interview, you should also consult our interview coach to go detailed information on how to prepare for your next interview.